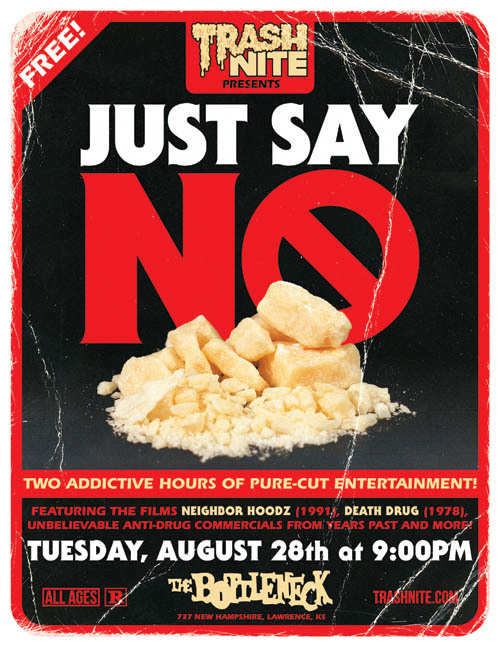 TRASH NITE: TRASH NITE presents JUST SAY NO! TRASH NITE presents JUST SAY NO! For the final installment of our 2012 summer series, we thought we should use the platform we have to do some good in our community, to promote a message that we feel very strongly about. We've spent the entirety of August combing through countless VHS tapes to bring you that message, which is this: Sometimes it just doesn't get weirder than the war on drugs. Throw on your favorite D.A.R.E. 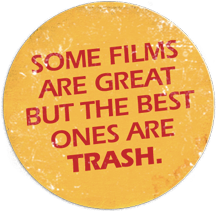 t-shirt and join us for JUST SAY NO, a Trash Nite special presentation! It's two addictive hours of pure-cut entertainment, featuring condensed versions of the films Neighbor Hoodz (1991) and Death Drug (1978), all put together in the style of a mid-80s local TV broadcast, complete with commercial breaks featuring anti-drug PSAs from years past and MUCH MORE! All ages are admitted and it's absolutely FREE!